In Russia, fake whisky might not just be a disappointingly inferior version of the real thing; it could kill you. And, while some copies are laughably amateur, counterfeit spirits constitute a huge – and growing – market. Erkin Tuzmukhamedov investigates. Fake Scotch: Can you tell the difference between a real and a fake? Knowing what the genuine article looks like could save lives. Last spring, an old friend of mine, Eugene Pivin – a well-known eye surgeon – was checking my eyes. In his cabinet stood a bottle of Hennessy XO Cognac – ‘a funny fake’, as he called it, and a gift from a grateful patient. The bottle didn’t look bad – average-quality glass, average-quality print – and, if you never saw the original, you might even think it was ok. The general shape is identical, but the sides – which should have thick ridges from the neck to the bottom, getting wider as they go – are missing, and the cap is not metallised, but is cheap thermoplastic. Read the label and you will notice that the Cognac is produced by JAS Hbnnessy & Co, not Hennessy (although the back label has the address of a real Russian distributor for the brand). A specialist in excise stamps would also notice they are fake. In fact, you don’t need to study any of these details. The clincher? The 50cl bottle. If you know Cognac, the standard bottle is 70cl and a half-bottle is 35cl. Hennessy never does XO in a half-litre bottle. Then I visited another good friend of mine for a regular check, Peter Drilenok, a dentist. He never takes money from me – but is always happy to get a nice bottle. This time for my nice bottle I took away a whole collection of fakes, similarly sourced – gifts from clients who want to be nice, but don’t have enough money for the real thing. In his collection were Johnnie Walker Black and Red, Chivas Regal 18 Years, Jack Daniel’s and another bottle of Hbnnessy. All in half-litre bottles. Some of the fakes were rather high-quality – Jacks and Johnnies were almost perfect, even to the eye of an average local brand manager. I have quite a nice collection of fake whisky from Egypt – Jhonnie Whaler Red Label, Johnie Walker Black Table, Chefas Rijal 12 years old and other nice samples, so the Russian fakes were a good addition. So I shared pics of the bottles on Facebook, with comments on how to tell a fake… And then a horrible thing happened. Russian media exploded with a story of mass poisoning from fake Jack Daniel’s bought on the internet in Krasnoyarsk, Siberia. That week, my fake bottles became TV stars. Channel One, Russia Channel 2, RenTV, Mir – most of the leading channels wanted my bottles and my comments. I did the interviews in the bar I manage, Jimi Club, and, with every new TV team, all the bartenders were laughing – again the same story? Well, yes, it was the same story, with the same problem from the TV point of view: Russian law prohibits alcohol bottles from being shown on screen. Imagine: Channel One doing a 45-minute special on fake spirits, and they can’t show full bottles, and they can’t even show close-ups of label and bottle details to help tell genuine from fake. And we are talking about information that could save lives. Produced by JA Hbnnessy & Co: it can be tricky to identify a counterfeit bottle if you haven't seen an original. The first reported poisonings in Krasnoyarsk happened on 19 November, killing three people, with a further nine ending up in intensive care. In both cases, police found empty Jack Daniel’s bottles. By 27 November, the death toll had reached 12, with 51 in intensive care. By mid-December, the figure was closer to 30 dead – but, by that point, the police and the medical authorities had stopped updating the total. Still the reports came in. A few days after the Krasnoyarsk outbreak, there were two deaths in the town of Gai, near Orenburg, from two half-litre bottles of fake Jack Daniel’s bought for RUB200. The exact death toll will never be known – some bottles may have travelled long distances. Cases of fake Jack Daniel’s were discovered dumped in forests around Krasnoyarsk and in the city garbage. One woman died after taking five bottles of fake Jack Daniel’s from a rubbish bin. She had drunk less than half a bottle. According to newspaper reports, when the seller was detained, he had 1,440 fake bottles of Jack Daniel’s, produced by himself and sold on the internet. Six more vendors were soon detained. 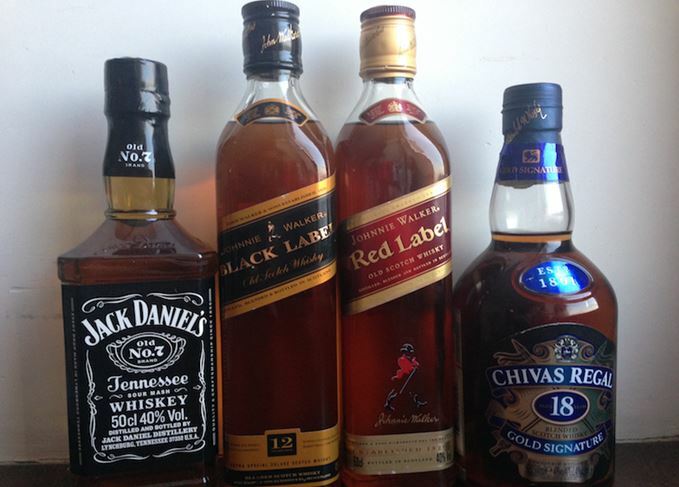 Police raided warehouses, finding cases of Johnnie Walker Red/Black/Blue, White Horse and Chivas Regal, Jack Daniel’s, Jameson, Olmeca Tequila and Hennessy Cognac. All fake, all recognisable brands that lead their legal markets. Over 6,000 bottles were seized in Krasnoyarsk, and police reported that around 700 might still be in circulation. Soon after the Krasnoyarsk poisonings, police detained someone in Mytishi, 10km from Moscow, who confirmed he had sold fakes to Krasnoyarsk dealers. In Krasnoyarsk itself, police reported 15 websites and 13 social media pages, all selling fake alcohol for RUB400-600 (US$5-7.50) per bottle. Tests have shown that the Krasnodar Jack Daniel’s bottles contained a mixture of 60% methanol with ethanol and water, along with added colouring and aroma concentrates. How did it happen? Perhaps this: spirit is sold in 200-litre drums. One drum containing methanol instead of ethanol – it’s impossible to tell the two apart by aroma or taste – was used in combination with ethanol to produce a deadly mixture. Then again, the Orenburg cases might not be related to Krasnoyarsk. Orenburg is closer to China and, along the Chinese border, there are numerous reports of methanol drums smuggled from China and mistakenly used instead of ethanol. Few people can understand the markings on the outside of the drums. On this occasion, the quantities involved were relatively small: the Krasnoyarsk batch is estimated at about 450-1,200 litres. So we are talking about 900-2,400 half-litre bottles. A limited edition indeed. And this time it was not a terrorist attack, but in the future? Next: Erkin investigates the terrifying scale of the fake alcohol market in Russia.